Glynna Prentice, una de las editoras de la publicación norteamericana International Living ha visitado Vitoria-Gasteiz y le ha gustado mucho, como se puede ver en esta video-tarjeta postal que encontramos en la web del magazine. Un bonito regalo para los gazteitarras que en estos dias están celebrando sus fuestas más importantes, las de la Blanca. Vitoria is in the green, mountainous interior of northern Spain, about a 45-minute drive south of Bilbao, the industrial port city on Spain’s north coast. Vitoria (or Victoria-Gasteiz, to give the city its complete name) is the capital, in fact, of Spain’s Basque region, which is one of the most prosperous areas of the country. 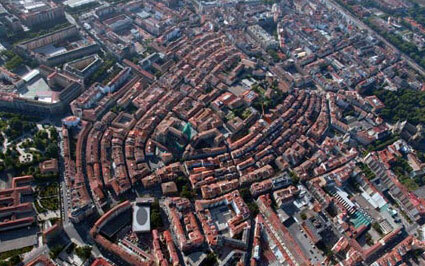 This region is green and hilly, and many of Vitoria’s streets are steep.